Warren Buffett had some harsh words for Wells Fargo at Berkshire Hathaway's annual meeting. The bank, which is Berkshire (BRKA)'s largest stock holding, continues to deal with fallout from its fake accounts scandal. 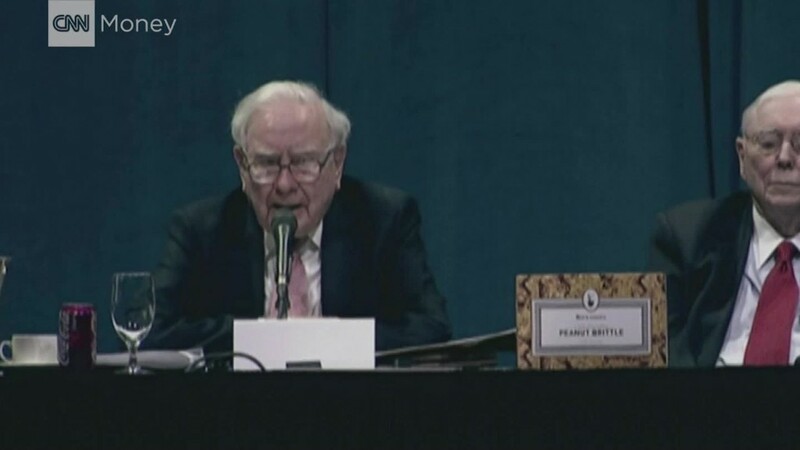 "They totally underestimated the impact of what they had done once it became uncovered," Buffett told thousands of shareholders gathered in Omaha on Saturday. He said it was a "huge, huge, huge error" if the company received internal calls from employees flagging misbehavior and decided to ignore them. "The main problem was that they didn't act when they learned about it," Buffett said. Buffett also slammed the Wells Fargo's incentive system for employees, noting that workers were paid, graded and promoted based on the number of services they sold to customers. "It turned out that it incentivized the wrong kind of behavior," Buffett said. Over the past year, Wells Fargo (WFC) has come under fire for illegal sales practices. The company owned up to creating as many as 2 million fake accounts between 2011 and 2015 and firing 5,300 employees for those actions. It has since apologized and paid $185 million in penalties. Buffett also said that Wells Fargo seemed to be blinded by the fact that the banking industry had gotten used to paying billions of dollars in fines for mortgage malpractices and $185 million seemed paltry by comparison. "They measured the seriousness of the problem by the dimensions of the fine and they thought it signaled a less offensive practice," Buffett said. "We agree with Mr. Buffett's comments and value Berkshire Hathaway as a long-term shareholder and customer," Wells Fargo spokesman Mark Folk said in a statement Saturday. "We have taken decisive actions to fix the problems, make things right for customers, and build a better Wells Fargo." Casualties, however, have continued to mount. Wells Fargo announced last month that it's clawing back another $75 million from two top executives, including $28 million from former CEO John Stumpf -- the result of a massive six-month investigation by the bank's independent directors. The 110-page report found that Stumpf was "too slow to investigate or critically challenge" the bank's sales gambits. Buffett touched upon the issue. "At some point, if there's a major problem, the CEO will get wind of it," he said. "And at that moment, that's the key to everything." Berkshire owns about 473 million shares of Wells Fargo. Berkshire recently needed to sell a small position to keep its stake in the company below 10%, the Federal Reserve limit for outside investors.